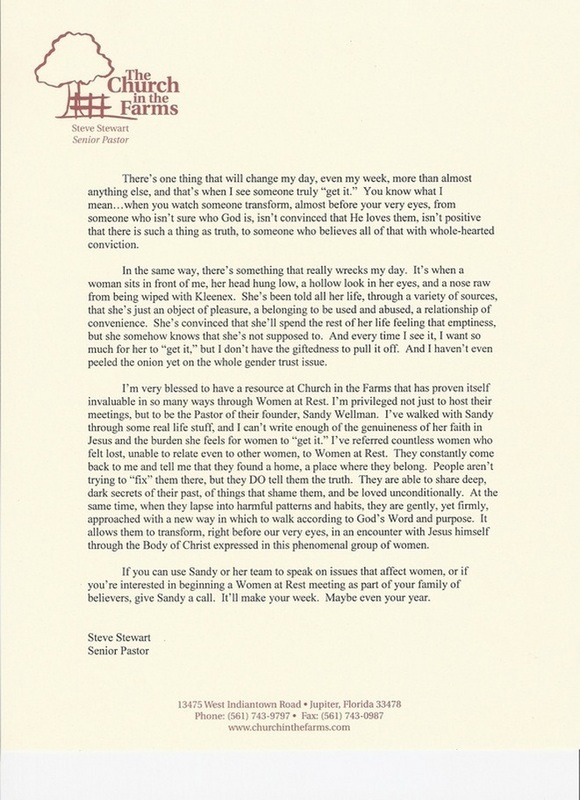 Below are letters from various leaders and people whom Women at Rest has personally affected. 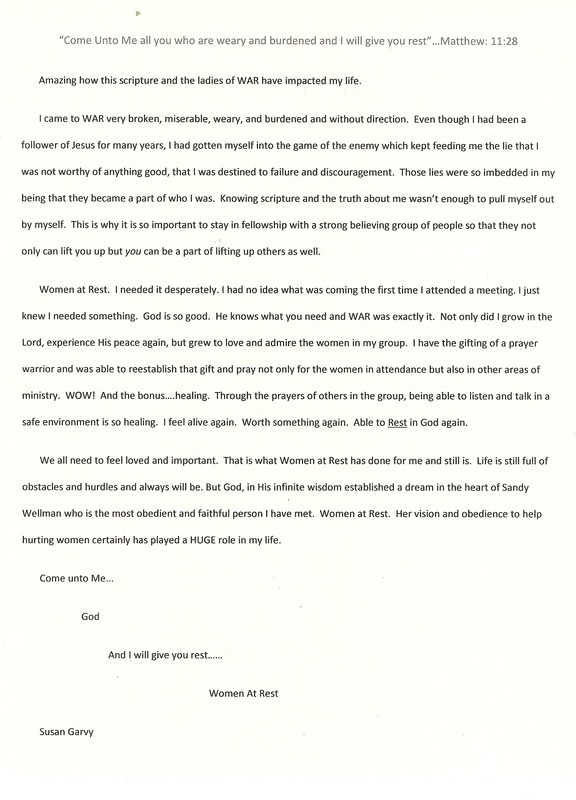 We feel so blessed to have Women at Rest as a part of our Women's Ministries program. By teaching the importance of a meaningful relationship with Jesus Christ and with one another, this ministry has guided hurting women every week at our church, through rivers of disappointment and over mountains of discouragement. Women at Rest has been instrumental in encouraging our women that God will help them be a positive influence in a negative situation. Through prayer, meaningful teachings, Spirit-filled dialogue and thoughtful follow-up, Women at Rest has enabled many women to realize that the Lord really does intend for us to live in a state of continuous victory even in the midst of adversity. When I came to this ministry I was so lonely and lost and at the end of my rope. The women I met here had such pain, but such peace. I wanted this peace. These women led me to Jesus, and in Him I found peace. I have been familiar with the work of Women at Rest for many years, and I know it has been a source of rich blessing to the women of South Florida. I would recommend this ministry to any woman needing the encouragement of mature, godly women committed to spiritual and relational growth. Women at Rest teaches women how to keep their focus on Christ and to trust Him to handle the challenges in their lives. I see God's hand print all over this ministry. I have had the privilege of prayerfully watching the conception and birth of Women at Rest. 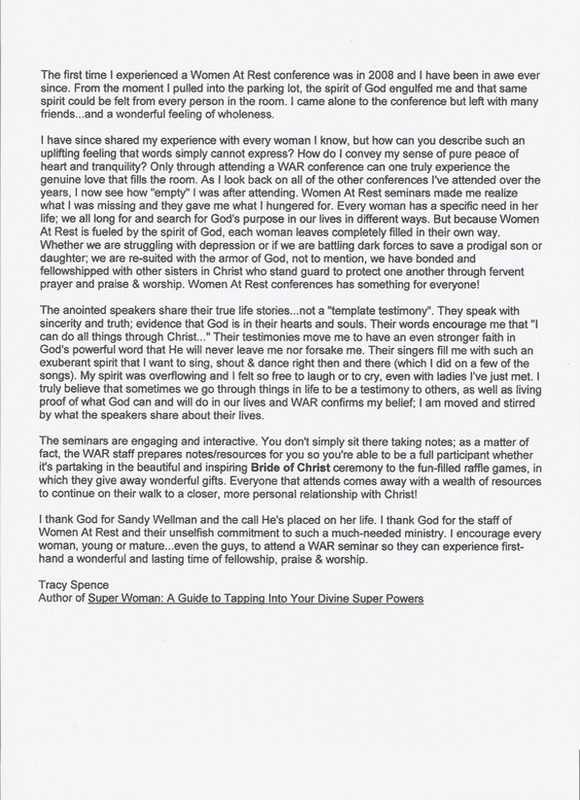 Women at Rest has grown into a vital ministry of encouragement and hope for women of all ages, denominations and stages of life. 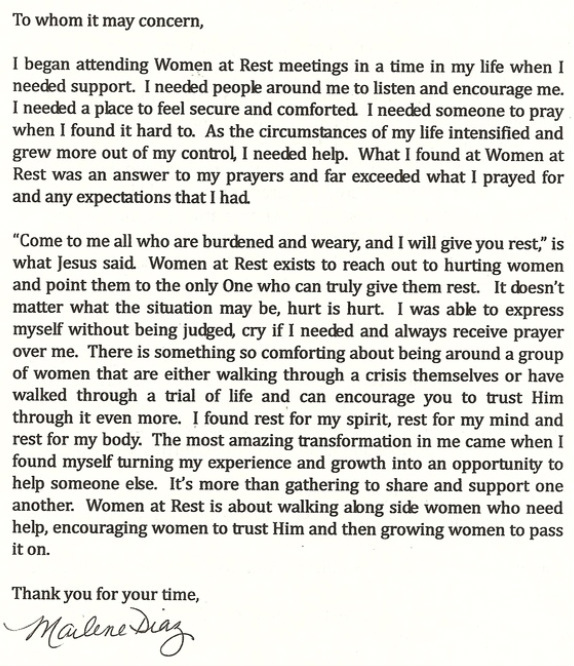 Women at Rest is an invaluable resource in our ministry to people. It is another arena in which the enemy is engaged and defeated in his great battle against the family. Women at Rest provides a nurturing environment for women to confront the realities of life under the direction of the Lord Jesus Christ. We have seen many families transformed when reality is met with prayer and faith in our God who delights in doing the impossible. As a husband, Women at Rest changed my marital relationship. 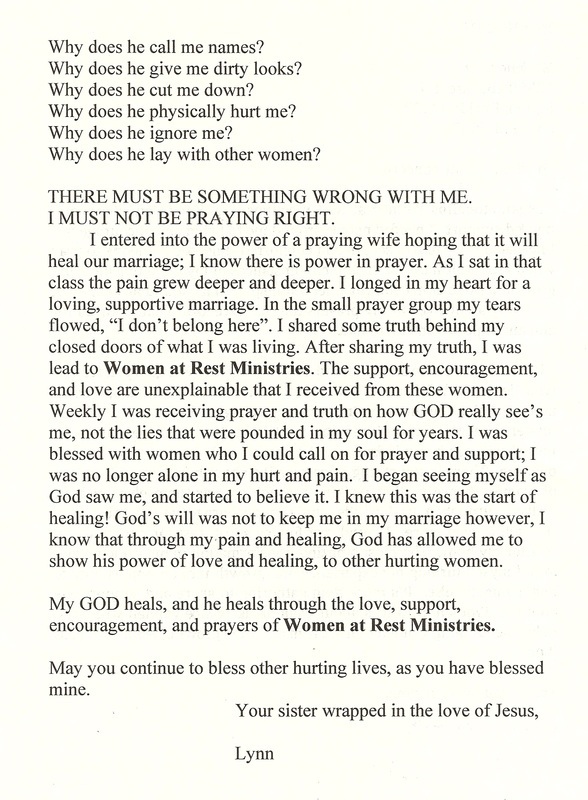 My wife's participation in this ministry gave her a place to be with other women and learn through their experiences. She stopped focusing on me and what I was or wasn't doing and began focusing on God which allowed her to heal and grow. That gave me the opportunity to grow as well which improved our individual relationships with God and also our relationship with each other. 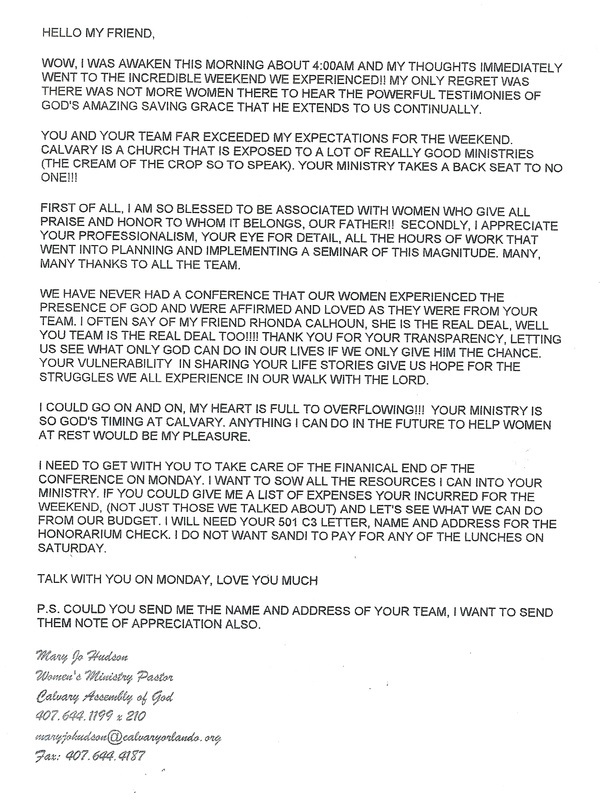 I would like to say that I embraced this ministry and was a staunch supporter from the start. The truth is that I was very suspicious of them. I decided to watch them for a while. The fruit of this group became apparent quickly. I saw many of the women in my office, and two things happened. First, they took their focus off their husbands and onto Christ. Second, their husbands almost always came in for help. I went from suspicious critic to a major supporter of this group. 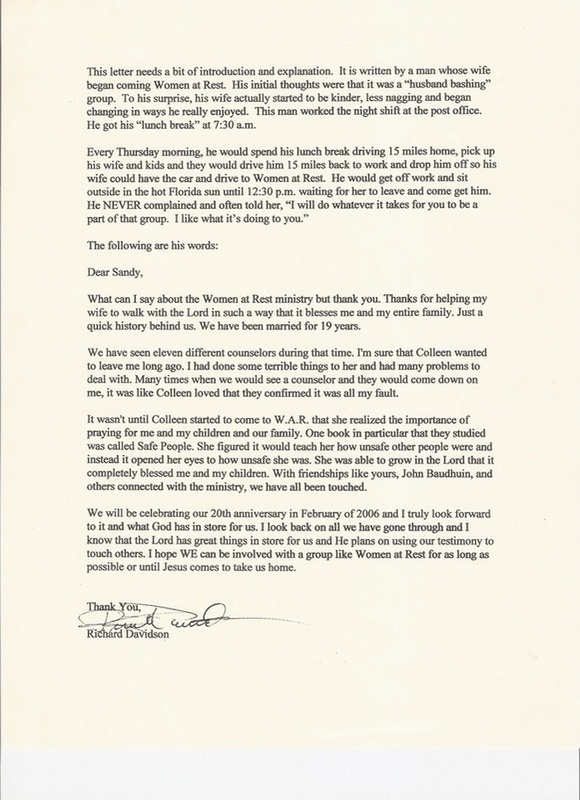 As a pastor, I can testify to the credibility and biblical roots of the mentoring that Women at Rest provides. Clients of mine who are also attending Women at Rest meetings seem to need less time in counseling and have better long-term results due to the mentoring and support they get. Many clients have gone on to help others and most have also taken on higher positions of leadership in their churches. The Women at Rest ministry is an opportunity for women to study God's Word and apply it to their life and its challenges. The ministry offers an opportunity to share one's struggles and joys with other women who encourage and support each other woman-to-woman. It is a refreshing answer to today's hectic pace and high stress levels. 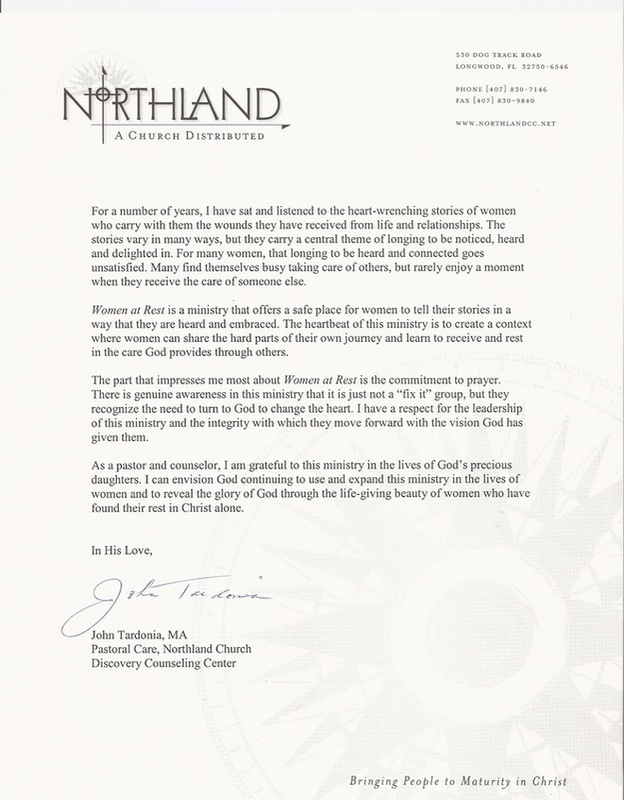 I strongly encourage the women of our church to be a part of this wonderful ministry.